Ever since I shared this recipe and tutorial for semi-sweet chocolate ganache drip cakes, I’ve gotten so many questions about making white chocolate ganache drip cakes. I’m so excited to share these tips with you because I know how finicky white chocolate ganache can be if you don’t get the ratio and timing just right. In fact, the first time I made it (using a super popular recipe that won’t be named) the ganache was so thin and runny that the drips just ran down the side of the cake and pooled at the bottom, even after cooling it to below room temperature! 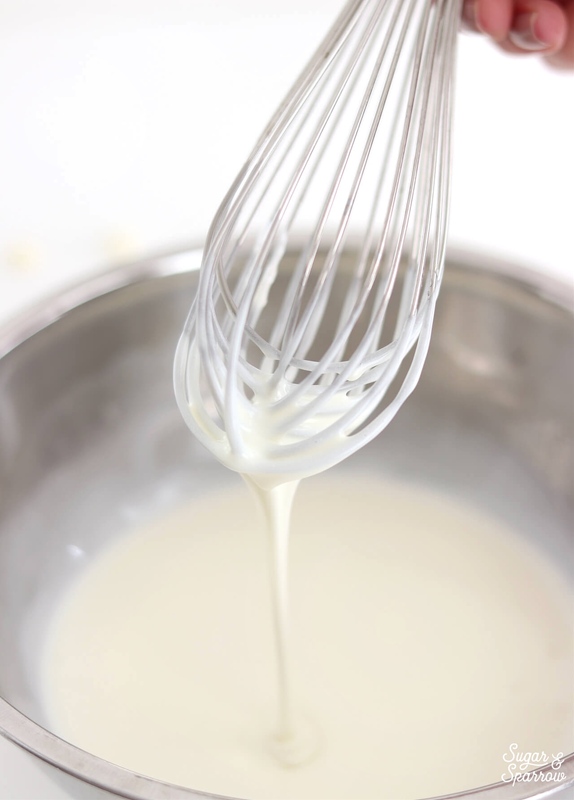 I have since experimented with white chocolate ganache to find the perfect ratio of chocolate to heavy whipping cream, and have found some handy tips for making it extra white and beautiful. The first thing you need to know about white chocolate is that it’s not a true chocolate, meaning there’s a lack of chocolate solids and therefore doesn’t behave the same as semi-sweet, milk, or dark chocolate. Instead, it’s made from a mixture of sugar, cocoa butter, milk products, vanilla, and some sort of fatty substance called lecithin. Although I’ve never tried making white chocolate ganache with anything fancier than Hershey’s white chocolate chips, you can feel free to go as branded or non-branded as you want. Generic white chocolate chips or a white chocolate bar chopped into small pieces will work just fine. The perfect white chocolate ganache ratio for creating drip cakes. Place white chocolate chips into a heat resistant bowl (glass or metal). If you’re starting with a white chocolate bar, chop it into small pieces until they’re about the size of chocolate chips. In a saucepan over medium-high heat, warm heavy whipping cream until it just starts to boil. I always look for small bubbles forming around the edge and a soft boil starting in the middle. When you see that it’s just starting to boil, pour it over the white chocolate and let sit for about five seconds. 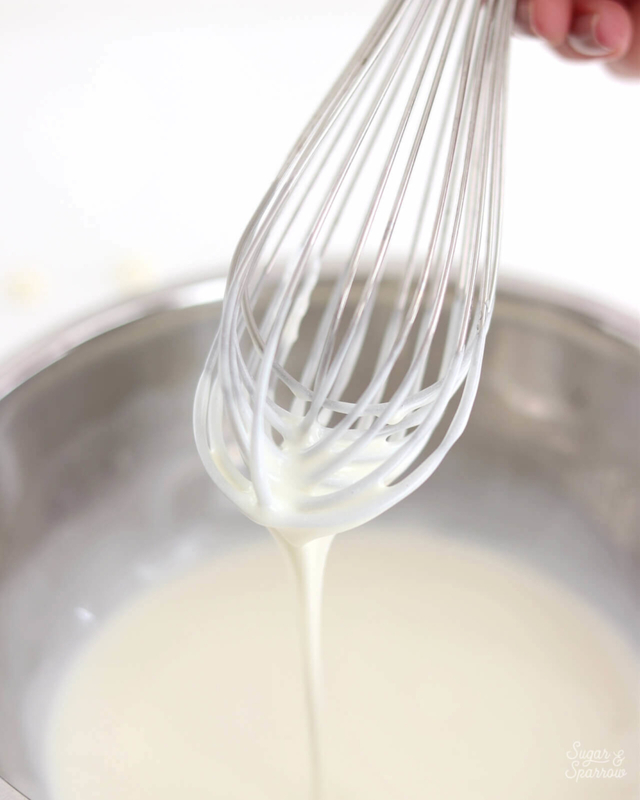 Whisk it together until it’s uniform in consistency and there are no bits of chocolate left on your whisk. Whiten or color the ganache (optional), then cool ganache at room temperature for about 30 minutes, or until the ganache itself is room temperature. Make Ahead Tips: this ganache can be made ahead and stored in an airtight container in the refrigerator for up to two weeks. When you’re ready to use it, microwave it in 10 second increments, stirring after every interval until your ganache is room temperature and uniform in consistency. The thing about white chocolate chips is that they aren’t exactly as white in color as they seem to be. To whiten the ganache, I swear by Americolor Bright White food color gel. 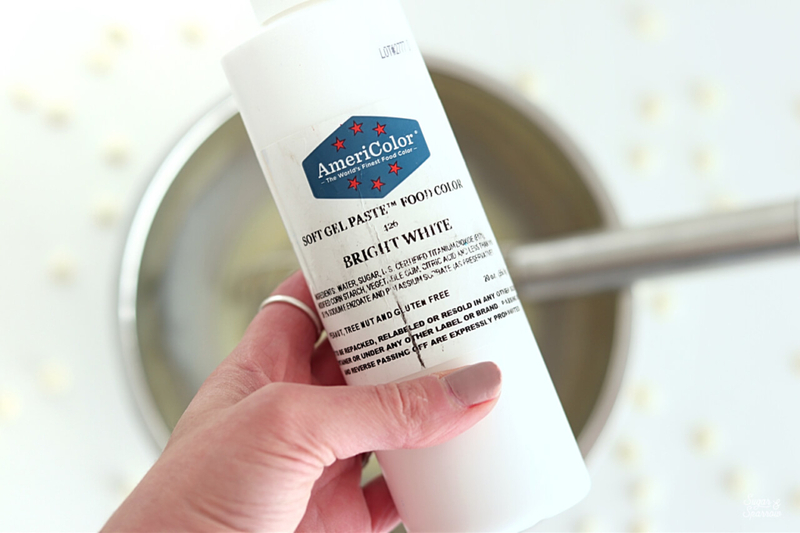 It works like a dream every time, and you only need about half a teaspoon per batch of white chocolate ganache to get a perfectly bright white. 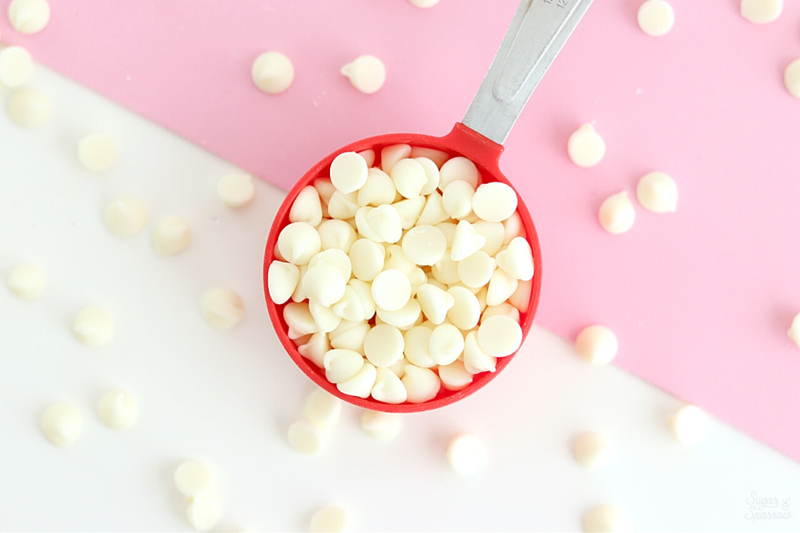 Some bakers like to use white candy melts in place of white chocolate chips to make white ganache, but I don’t like the taste of candy melts. So the whitening method is my favorite option. Once you’ve whisked the ganache together, it’s crucial to let it cool on your countertop until it’s room temperature, about 20-30 minutes depending on how cold your environment is. Trying to speed up this process by placing ganache in the refrigerator doesn’t usually end well – I’ve found that it cools unevenly, leading to thick, globby drips. Cooling in the fridge also leads to the urge to stir it too often. Ganache (especially white chocolate!) does not like to be stirred too often, and the end result can mean that your whipping cream starts to separate from the chocolate. You’ll know that this has happened because the ganache will look grainy and dull, or even separated like oil and water. To fix situations like these, you’ll need to reheat the ganache to 92ºF to melt the fat crystals and re-whisk to bring it back together. There’s a science to this tip. Since molecules move more slowly at cooler temperatures (and warp speed at higher temperatures), it makes a lot of sense that you can better control how far the white chocolate ganache drips when the buttercream is chilled. Make sure that after you do your final coat of buttercream, you chill the cake in the refrigerator for at least 30 minutes. When your buttercream is nice and chilled, do a test drip by letting the ganache run down the side of your cake. If it travels rapidly and pools at the bottom, your ganache is too warm. Continue to cool the ganache for another 5-10 minutes and try your test drip again. If it’s globby or doesn’t travel very far down the side of the cake, it’s too cold. Reheat the ganache in the microwave for about 10 seconds, stir, and try again. Repeat the reheating process as needed until you get the perfect consistency. The good thing about a test drip is you’re able to see how the ganache will behave. That way you don’t have to commit until you like what you’re seeing. Whether you’re using a spoon to create drips (like I am!) 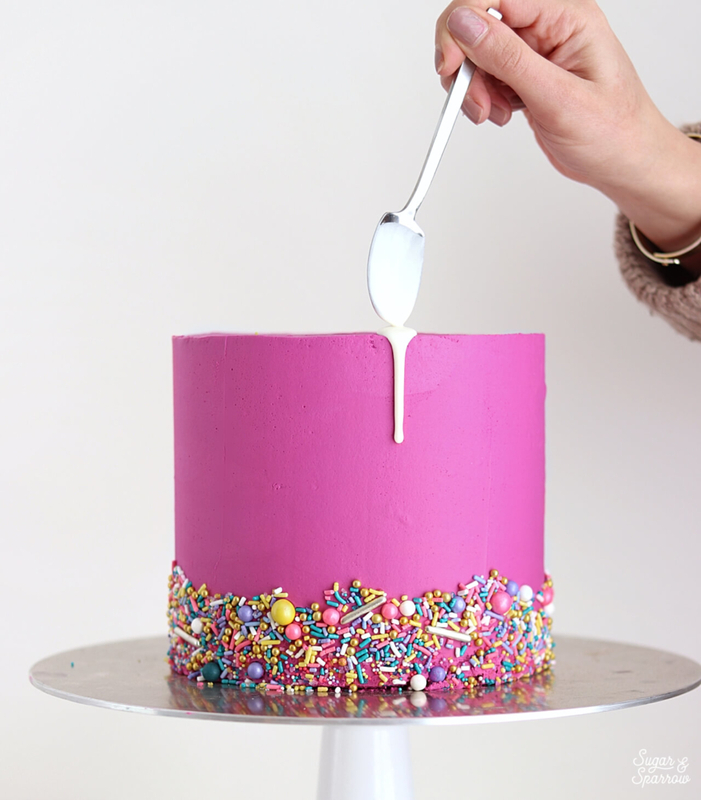 or you’re into the squeeze bottle method, it’s best to drip the sides of the cake before filling in the top. 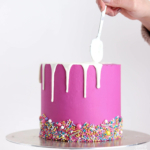 Although it might be tempting to just dump all of the ganache on the top of the cake and let the drips fall where they may, you’ll have more control over the length of each drip by starting with the sides (after a successful test drip of course). Try not to add too much ganache to the top when filling it in, because if you add any more to the drips you’ve created, it will make them travel farther than you’d like. Instead, try to use just a little ganache and spread it so that it just touches where your drips begin. The ganache on the top should self-level a bit, so don’t worry too much about getting it super smooth. 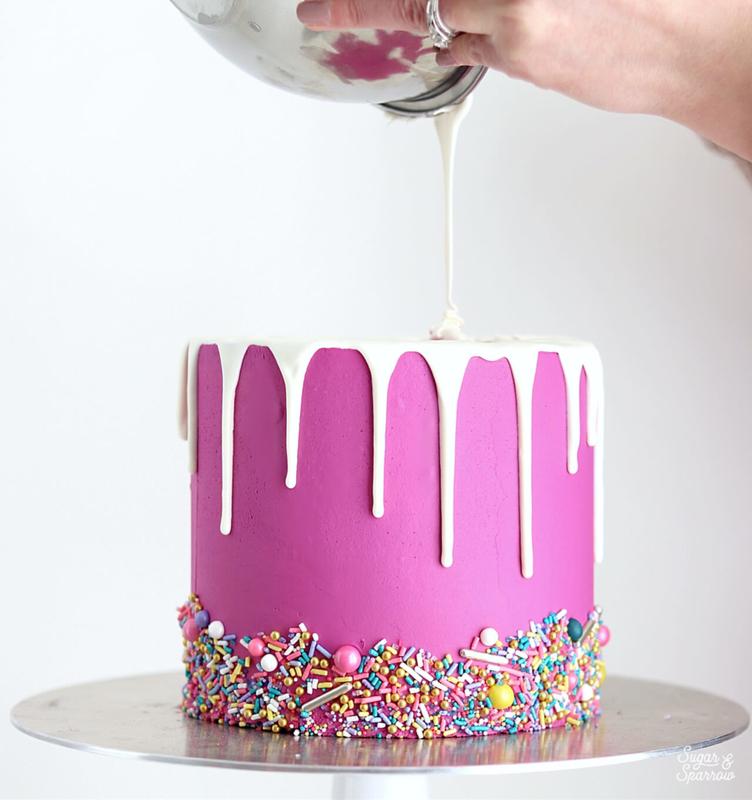 And there you have it – everything I know about dripping cakes with white chocolate ganache. It’s a really good skill to have in your cake decorating repertoire, especially with how versatile white chocolate ganache can be color-wise. Adding a little food color gel can turn it any vibrant color of the rainbow! And whether you keep it white or color it up, I promise it’ll taste a million times better than candy melts. 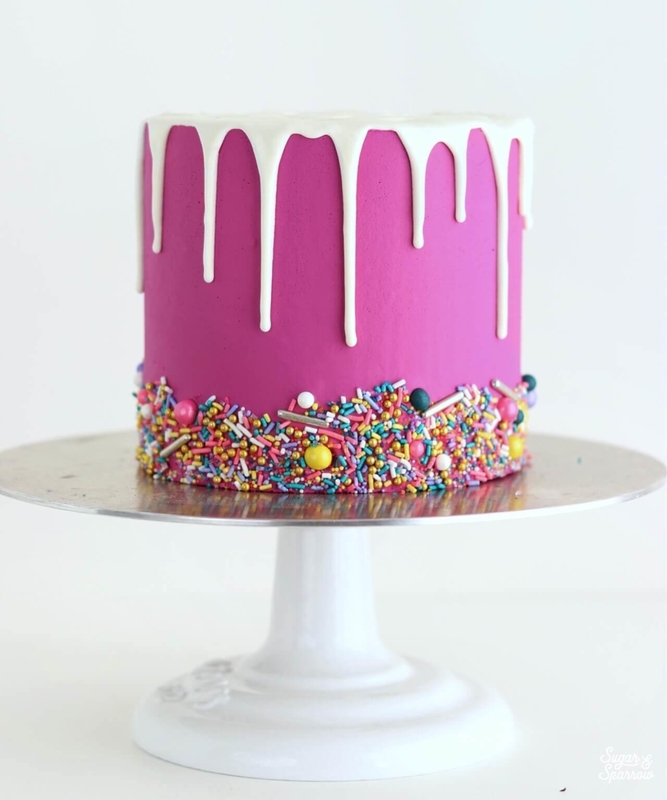 Is there anything else you’d like to know about drip cakes? I’m certainly not an expert per se, but if you have more questions, let me know in the comments below and I’ll do my best to answer! Can you use can’t melts? Hi Karina! You can use melts, but as I mentioned in the post, I never do because I don’t like the taste. The ratio for making ganache with candy melts is the same recipe though. So, when I did a white chocolate drip recently, 2 things happened. Hi Amy, what ratio did you use for the white chocolate ganache recipe? It sounds like there was too much cream added to the white chocolate, making it too runny in consistency (that’s happened to me before when I’ve used a 1:1 ratio and even a 1:2 ratio). 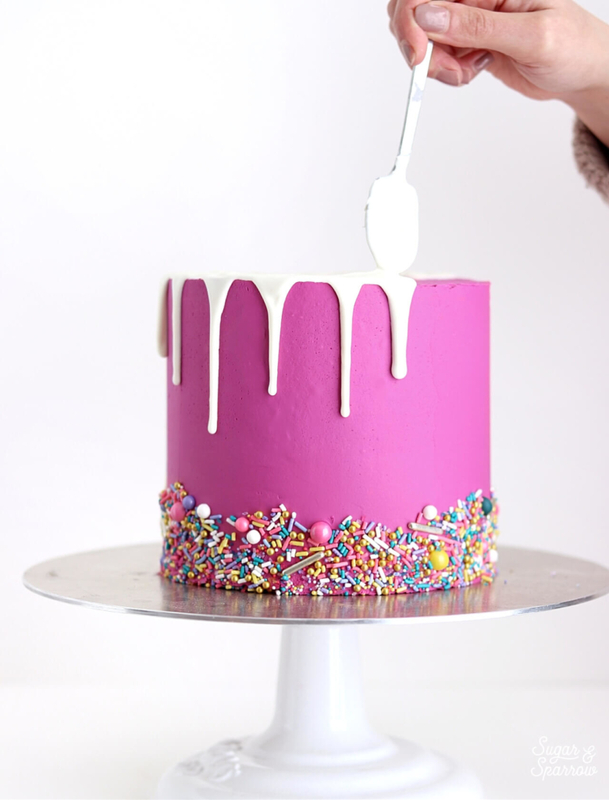 If the ganache is too runny even at room temperature, the drips will continue running and making other decorations (like the swirls on top of your cake) slide. How do you get that perfectly smooth buttercream? I’ve tried and tried, but it always has an uneven look. Hi Donna! Smooth buttercream took me a long time to master, but I wrote out a tutorial here with all of my best tips and recipe: https://sugarandsparrow.com/how-to-frost-a-cake I hope that helps! I am a home-baker and I am soooo happy for this tutorial!!! 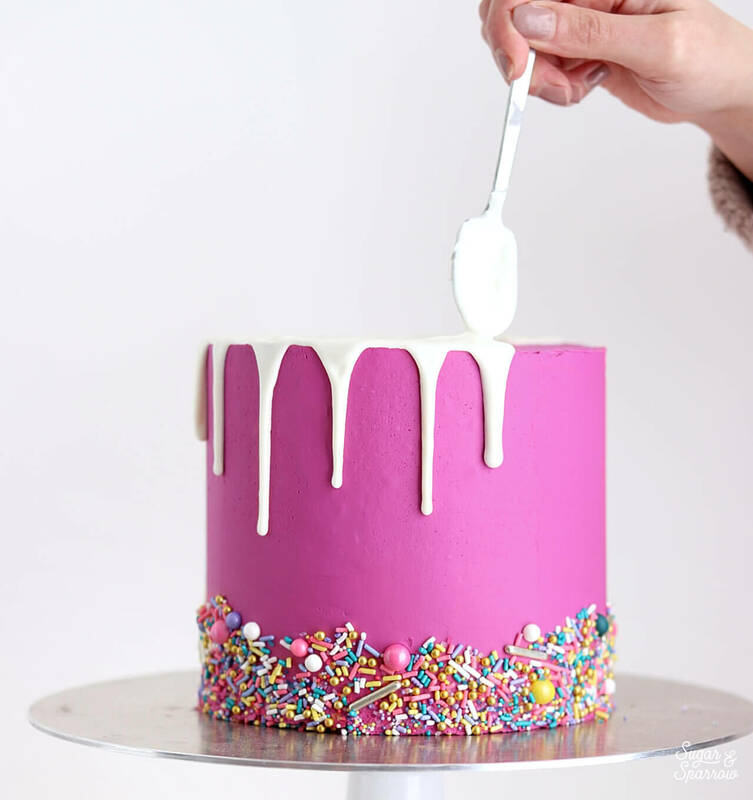 Hi there, I’m about to attempt this as my first drip cake but it is for tomorrow so I’m worried about how to store the cake overnight. Some websites have said if I put the completed cake in the fridge overnight that the chocolate ganache will bubble and look bumpy for tomorrow. Can you please advise what best. (It’s very humid currently where I am so I’m worried about the chocolate continuing to drip if it stays too warm). Hi Paula! No need to worry about storing the cake in the fridge overnight. I do it all the time with no problems at all! The drip always looks the same after storing in the fridge (no bubbles or anything!). Just follow the steps in this tutorial and make sure that your test drip yields perfect results before completing the drip and you’ll be good to go! Hi I’m wondering if white chocolate Ganache be infused with anything? Like Thai tea or earl grey ! Hi Noora! Although I’ve never done it before, I’m sure you could soak a tea bag in the heavy whipping cream and infuse it before (or while) bringing it to a boil. I’ve definitely added spices like cinnamon to my heavy whipping cream before bringing it to a boil and pouring it over the chocolate and it’s worked amazingly as well. Let me know if you try infusing it with a tea bag, I’m so curious now! I’ve tried this method twice and it worked wonderfully at first. Glass like texture on top- perfect drips. I then stored the cake in the fridge and the ganache has become completely rippled. Like waves running across the entire top. Any idea why this happened? I used your buttercream recipe- and chilled the cake in the fridge for two days prior to dripping. Could it be the frosting dried out and it’s sucking the moisture from the ganache? I’m just at a loss. Hi Megan! I’ve never ever had white chocolate ganache ripple before – it always looks just like when I first dripped it after storing in the fridge. I’ve never added a drip after chilling a cake for two days though. Typically I add a drip after chilling the cake for thirty minutes or overnight at the most. So your theory on adding the drip after the cake has had too much time in the fridge might be where things are going wrong. Did you use the same ratio in the recipe on this post or alter the ingredients in any way? Is it only the top of the cake that ripples or the drips as well? I used the same ratio and have only noticed the ripples on the top. So odd! Fingers crossed the next one turns out- it’s resting with a crumb coat tonight- I’ll frost tomorrow and drip in the afternoon! Let’s see if that helps. For storage afterward would you suggest cover and refrigerate or room temp? Thanks! Let me know how it goes!! After I drip the cake I usually pop it back in the fridge for about 5-10 minutes to let the ganache set up before continuing to decorate the cake. After I finish decorating I put it right back into the fridge until I’m ready to deliver it or bring it to room temperature for serving. I spent some time googling wrinkly ganache but I’m not finding concrete answers. The best guesses seem to be that the cake is too cold and makes the chocolate set too fast. Hoping this next round with less chilling time on the cake is perfection! Hello and thanks for the tips! White chocolate is so fussy haha. Two questions: what size cake did you use and where do you get your large bottles of Americolor? I wasn’t sure if Amazon’s were good quality or not. Thank you! Hi Nikkole! Americolor sells their products on their website at https://www.americolorcorp.com/ and you can also find them directly from Americolor on Amazon. Both channels are totally reliable because they’re from the same company (as long as you make sure Americolor is the Amazon seller), just different means of selling them. Thank you! I kind of had a derp moment when I read about their website. Of course they have a website. Thanks for being kind while letting me know haha. Thank you very much!!! It worked perfectly on my first try! I have been having so many issues with white chocolate until now! I really appreciate it, you were right it was all about patience with the cooling process. That is so wonderful to hear, Wendy! I’m so glad it worked out on your first try!! Hi Iman! I have never covered an entire cake with white chocolate ganache before, but after a little research, it seems this recipe would be the right ratio with a few additional steps. First, after making the ganache, place it in an airtight container in the refrigerator for at least 4-5 hours so it can set. Next, remove the ganache from the fridge and leave it out on the counter to soften slightly, then whip with your stand mixer on medium for about 30 second. It should then be the consistency of peanut butter, which will be perfect for frosting the cake. After frosting the cake place it back in the fridge to make it extra firm. Like I said before, I haven’t done this with white chocolate ganache before but after reading several other blog posts this is the same ratio of white chocolate to heavy whipping cream that other bakers are using to ganache their cakes. Hope that helps! What color did you use for your buttercream? Hi Whitney! Thank you so much for your straightforward advice and instructions. I have a question… can you substitute the heavy cream for whole milk? I am assembling the cake now for my daughters birthday tomorrow. I can’t find any heavy cream where I live believe it or not lol… Thank you in advance! I am looking to use a dark chocolate ganache as my crumb coat, do you think it will be OK to then apply a white chocolate ganache as drip on my cake on top? Worked great first try! The only issue I had is that it was on the cool side in my kitchen that day (probably around 65F), so letting it cool for 20 min was too long and it wouldn’t drip. I simply put the squeeze bottle full of chocolate in a hot water bath for a minute or two and it worked great after that. Thanks for the great tutorial! Awesome, Nikki!! So happy it worked for you and great job troubleshooting the kitchen temperature!! Hi Ashley! Americolor is water-based, but it works really well for coloring ganache. I think it’s because the process of making ganache involves adding so much liquid, it changes the chemistry of the mixture. While melted chocolate will seize if you add water-based food color, chocolate ganache won’t since it’s so liquid to begin with. And since Americolor gels are so concentrated, you don’t need to add a ton to get a rich color. Hope that helps! Hello. This question is not really relevant, but what food dye did you use to get that colour of buttercream on the cake? I’m guessing you use americolor but I just would like to know what the name of the colour is because the colour is really amazing 🙂 Thanks in advance. I would like to couloir the drips gold. Can I paint over the ganache with lustre dust (mixed with solution)?